Clinical suspicion for Choledocholithiasis, Cholelithiasis, or Cholecystitis in a patient presenting with acute abdominal pain. Additionally, presence or absence of The Sonographic Murphy's Sign should be documented. See "Approach" for a description of the sign. The gallbladder should be identified with the main lobar fissure, portal triad or superior pole of kidney as landmarks. 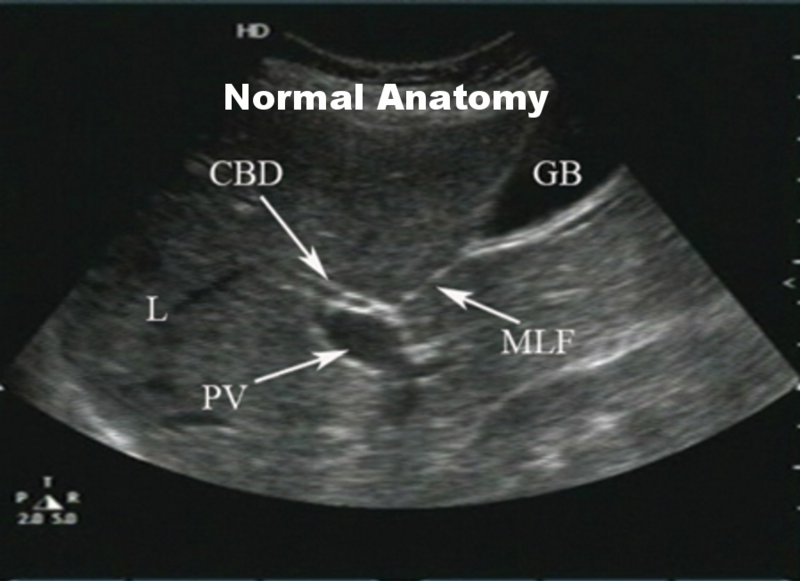 Both transverse and longitudinal views through the axis of the gallbladder should be obtained. Imaging of the common bile duct with measurements should be obtained. The presence or absence of a Sonographic Murphy’s sign should be documented. This is when the maximal intensity of patient's pain is when the gallbladder is in view directly beneath the probe. Compress multiple locations in the epigastrum and RUQ to evaluate for maximal intensity. Patient is supine. Elevating the head of the bed, inspiration and left lateral decubitus positioning can help facilitate imaging. "Subcostal Sweep" - Place the probe over the xiphoid process in longitudinal orientation with the indicator at patients head. Ask the patient to inspire and hold, then sweep inferiorly and laterally along the subcostal margin. "X minus 7 " - Palpate the xiphoid process, move laterally to the patient's right 7 centimeters and place the probe in the nearest intercostal space. The gallbladder should be just posterior to the liver directly beneath the probe. It may be necessary to use a phased array transducer. "Flattening the probe" - In young, thin patients, the gallbladder may rest anteriorly and superiorly. Place the probe subcostally with indicator to the patient's right. Flatten out the probe as you aim towards the patient's right shoulder. If you still haven't found the gallbladder, it may be contracted if the patient recently ate a fatty meal. Consider waiting 30-60 minutes and repeating your scan. Gallstones are hyperechoic (bright) appearing balls of variable size, shape and number which create posterior acoustic shadowing. They are characteristically dependent and mobile within the gallbladder. Is there evidence of Cholecystitis or Choledocholithiasis? Gallbladder dilatation >4-5cm support the diagnosis of cholecystitis. CBD measurements should be < 4mm + 1mm/decade of age beyond 40 . All scans should be referred for confirmatory testing prior to intervention as clinically appropriate. Be careful not to mistake ascites fluid for pericholecystic fluid. Pericholecystic fluid is generally localized to the anterior wall of the GB. Not all thickened gallbladders are cholecystitis. 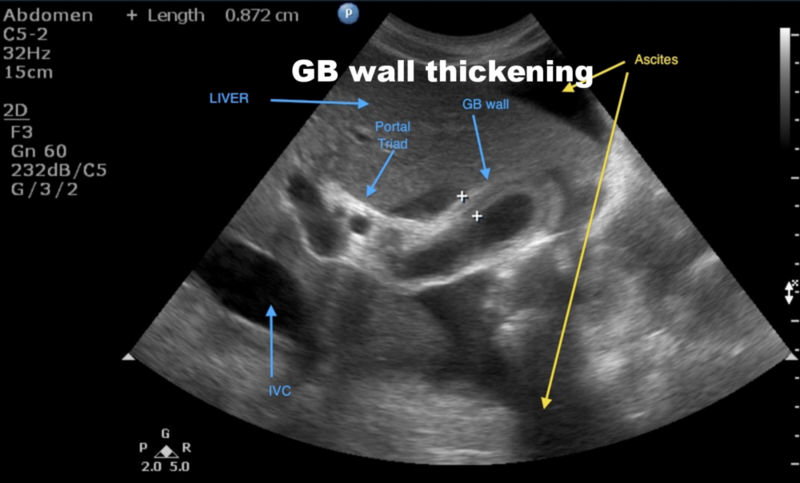 Patients with CHF or with ascites may have thickened GB walls. 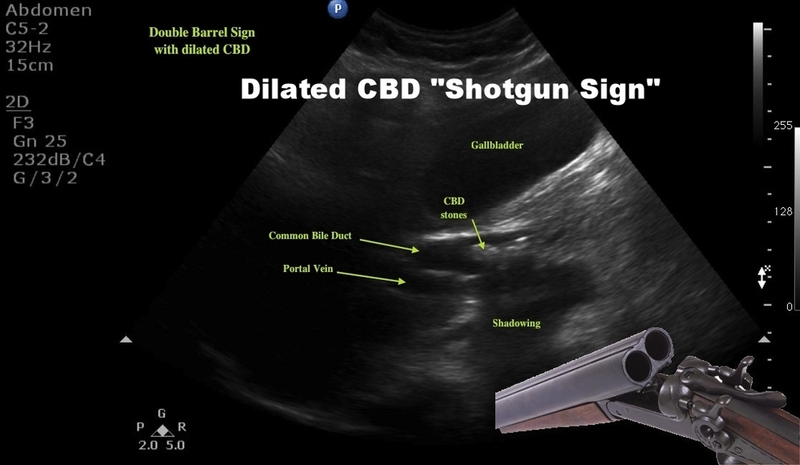 Wall Echo Shadow Sign - Sometimes a gallbladder may be contracted around a stone, so the only evidence of the gallbladder may be a WES sign in which there is a hyperechoic focus in the liver surrounded by a wall with a shadow posteriorly. Patient and probe positioning is perhaps the most important for biliary exams to insure success. Try left lateral decubitus position if unsuccessful supine. Also try the three methods in the "Probe and Positioning" section. Large renal cysts are often confused for the gallbladder. This is why it is important to obtain two views, as a renal cyst will appear the same in both views, whereas a gallbladder will lengthen in one.